and myriad other shapes in the sky. Once upon a time, about 13.8 billion years ago, our universe sprang from a quantum speck, ballooning to one million trillion trillion trillion trillion trillion trillion times its initial volume (by some estimates) in less than a billionth of a trillionth of a trillionth of a second. It then continued to expand at a mellower rate, in accordance with the known laws of physics. So goes the story of cosmic inflation, the modern version of the Big Bang theory. That single short, outrageous growth spurt fits all existing cosmological data well and accounts for the universe's largeness, smoothness, flatness and lack of preferred direction. But as an explanation of how and why the universe began, inflation falls short. The questions it raises - why the growth spurt happened, how it happened, what (if anything) occurred beforehand - have confounded cosmologists since the theory emerged in the 1980s. "We have very strong evidence that there was this period of inflation," said Matthew Kleban, a cosmologist at New York University. "But we have no idea - or we have many, many ideas - too many ideas - what inflation was, fundamentally." To understand the origin of the universe, today's cosmologists seek to identify the unknown driver of inflation, dubbed the "inflaton." Often envisioned as a field of energy permeating space and driving it apart, the inflaton worked, experts say, like a clock. With each tick, it doubled the size of the universe, keeping nearly perfect time - until it stopped. Theorists like Kleban, then, are the clocksmiths, devising altogether hundreds of different models that might replicate the clockwork of the Big Bang. 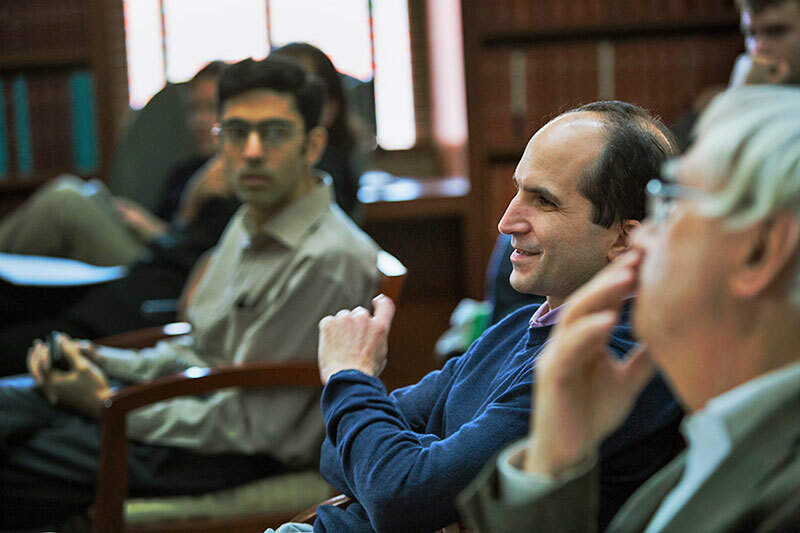 Like many cosmological clocksmiths, Matthew Kleban is an expert in string theory - the dominant candidate for a "theory of everything" that attempts to describe nature across all distances, times and energies. The known equations of physics falter when applied to the tiny, fleeting and frenzied environment of the Big Bang, in which they struggle to cram an enormous amount of energy into infinitesimal space and time. But string theory flourishes in this milieu, positing extra spatial dimensions that diffuse the energy. Familiar point particles become, at this highest energy and zoom level, one-dimensional "strings" and higher-dimensional, membranous "branes," all of which traverse a 10-dimensional landscape. These vibrating, undulating gears may have powered the Big Bang's clock. 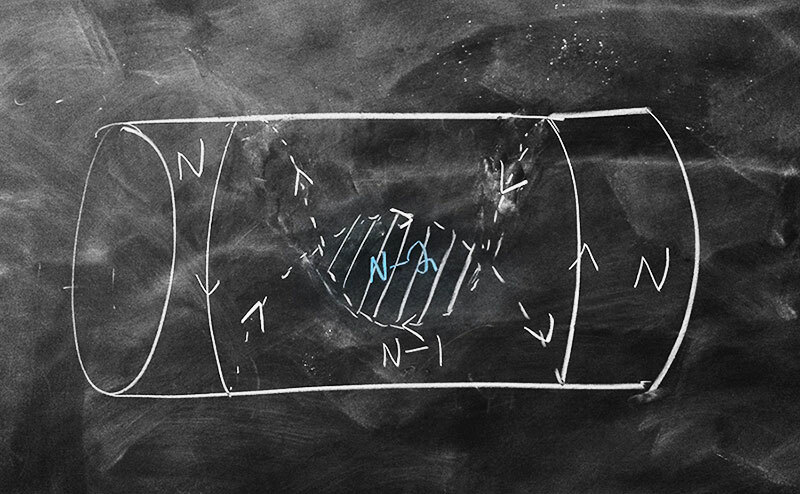 At his office on a recent afternoon, Kleban sketched his latest inflaton design on the blackboard. First, he drew a skinny cylinder to depict the string landscape. Its length represented the three spatial dimensions of macroscopic reality, and its circumference signified the six other spatial dimensions that string theory says exist, but which are too small to see. On the side of the cylinder, he drew a circle. This is Kleban's timepiece: a membrane that bubbles into being and naturally expands. As its inflating interior forms a new universe, its energy incrementally ticks down in clocklike fashion each time the expanding circle winds around the cylinder's circumference and overlaps itself. When the energy of the "brane" dilutes, the clock stops ticking, and inflation ends. It's a scheme that some string cosmologists have hailed for its economy. "I think it's pretty plausible that some version of this happens," he said. of his Big Bang model known as unwinding inflation. Though Kleban acknowledges that it's too soon to tell whether he or anyone else is on to something, plans are under way to find out. The record of the inflaton's breakneck ticking can be read in the distribution of galaxies, galaxy clusters and superclusters that span the cosmos. These structures (and everything in them, including you) are artifacts of "mistakes in the clock," as Matias Zaldarriaga, a cosmologist at the Institute for Advanced Study (IAS) in Princeton, N.J., put it. That is, time is intrinsically uncertain, and so the universe inflated at slightly different rates in different places and moments, producing density variations throughout. The jitter in time can also be thought of as a jitter in energy that occurred as pairs of particles spontaneously surfaced all over an "inflaton field" and stretched apart like two points on an inflating balloon. These particles were the seeds that gravity grew into galactic structures over the course of eons. The pairs of structures spanning the largest distances in the sky today came from the earliest quantum fluctuations during inflation, while structures that are closer together were produced later. "is telling you in detail that the clock was ticking," said Nima Arkani-Hamed, a theoretical physicist at IAS. "But it doesn't tell you anything about what it was made of." 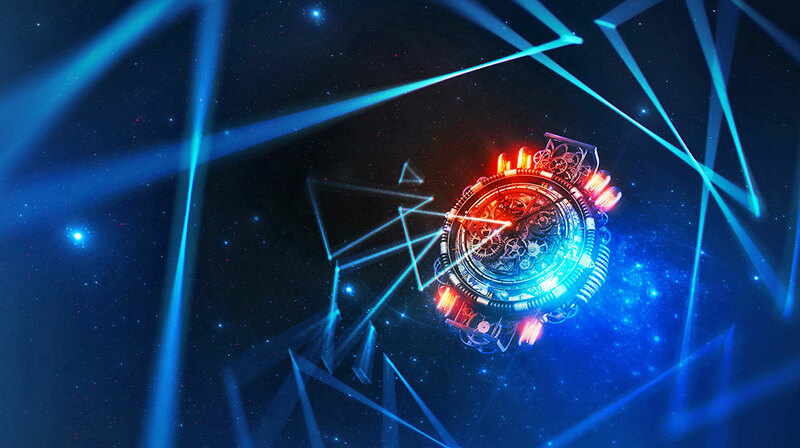 To reverse-engineer the clockwork, cosmologists are seeking a new kind of data. triangles, rectangles, pentagons and all manner of other shapes, which trace back not just to quantum jitter in the Big Bang's clock, but to a much more meaningful turning of the gears. 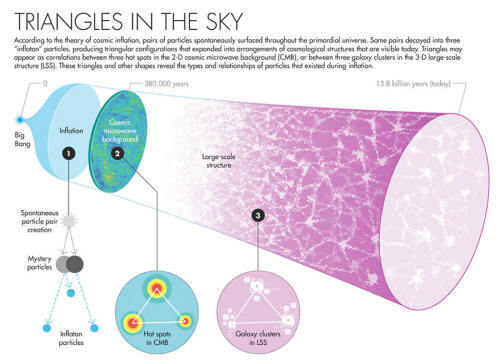 Teasing out the cosmological triangles and other shapes - which have been named "non-Gaussianities" to contrast them with the Gaussian bell curve of randomly distributed pairs of structures - will require more precise observations of the cosmos than have been made to date. And so plans are being laid for a timeline of increasingly sensitive experiments. "We're going to have far more information than we have now, and sensitivity to far subtler effects than we can probe now," said Marc Kamionkowski, a cosmologist at Johns Hopkins University. In the meantime, theorists are making significant progress in determining what shapes to look for and how to look for them. "There's been a great renaissance of understanding," said Eva Silverstein, a string cosmologist at Stanford University who devised the dimensional-winding mechanism used by Kleban, as well as many clock designs of her own. the minimum number of triangles and other shapes that are guaranteed to exist in the sky, due to the unavoidable effect of gravity during cosmic inflation. Cosmologists had been struggling to calculate the gravitational floor for more than a decade, since it would provide a concrete goal for experimenters. including some that are currently being tested. When Maldacena first calculated the gravitational floor, actually detecting it seemed a distant goal indeed. At the time, all precise knowledge of the universe's birth came from observations of the "cosmic microwave background" - the oldest light in the sky, which illuminates a two-dimensional slice of the infant universe as it appeared 380,000 years after the Big Bang. Based on the limited number of nascent structures that appear in this 2-D snapshot, it seemed impossible that their slight propensity to be configured in triangles and other shapes could ever be detected with statistical certainty. But Maldacena's work gave theorists the tools to calculate other, more pronounced forms of non-Gaussianity that might exist in the sky, due to stronger effects than gravity. And it motivated researchers to devise better ways to search for the signals. A year after Maldacena made his calculation, Zaldarriaga and collaborators showed that measuring the distribution of galaxies and groupings of galaxies that make up the universe's "large-scale structure" would yield many more shapes than observing the cosmic microwave background. "It's a 3-D versus 2-D argument," said Olivier Doré, a cosmologist at NASA's Jet Propulsion Laboratory who is working on a proposed search for non-Gaussianities in the large-scale structure. "If you start counting triangles in 3-D like you can do with galaxy surveys, there are really many more you can count." The notion that counting more shapes in the sky will reveal more details of the Big Bang is implied in a central principle of quantum physics known as "unitarity." Unitarity dictates that the probabilities of all possible quantum states of the universe must add up to one, now and forever; thus, information, which is stored in quantum states, can never be lost - only scrambled. This means that all information about the birth of the cosmos remains encoded in its present state, and the more precisely cosmologists know the latter, the more they can learn about the former. But how did details of the Big Bang get encoded in triangles and other shapes? "opened up the understanding of how it comes about." In a universe governed by quantum mechanics, all of nature's constituents are cross-wired, morphing into and interacting with one another with varying degrees of probability. Particles arising in these fields would have morphed into and scattered with each other to produce triangles and other geometric configurations, like billiard balls scattering on a table. These dynamical events would be mixed in with the more mundane quantum jitter from those particle pairs that popped up in the inflaton field and engendered so-called "two-point correlations" throughout the sky. A pair of particles might, for instance, have surfaced in some other primordial field, and one member of this pair might then have decayed into two inflaton particles while the other decayed into just a single inflaton particle, yielding a three-point correlation, or triangle, in the sky. Or, two mystery particles might have collided and split into four inflaton particles, producing a four-point correlation. Rarer events would have yielded five-point, six-point and even higher-point correlations, with their numbers, sizes and interior angles encoding the types and relationships of the particles that produced them. The unitarity principle promises that by tallying the shapes ever more precisely, cosmologists will achieve an increasingly detailed account of the primordial universe, just as physicists at the Large Hadron Collider in Europe hone their theory of the known particles and look for evidence of new ones by collecting statistics on how particles morph and scatter during collisions. Following Maldacena's calculation of the gravitational floor, other researchers demonstrated that even many simple inflationary models generate much more pronounced non-Gaussianity than the bare minimum. Clocksmiths like Silverstein and Kleban have since been busy working out the distinct set of triangles that their models would produce - predictions that will become increasingly testable in the coming years. Progress accelerated in 2014, when a small experiment based at the South Pole appeared to make a momentous discovery about the universe's birth. The announcement drummed up interest in cosmological triangles, even though the supposed discovery ultimately proved a grave disappointment. In the footage, the cosmologist Andrei Linde, one of the decorated pioneers of inflationary cosmology, and his wife, the string and supergravity theorist and cosmologist Renata Kallosh, answer their door to find their Stanford colleague Chao-Lin Kuo on the doorstep, accompanied by a camera crew. "It's five sigma, at point two," Kuo says in the video. "Discovery?" Kallosh asks, after a beat. Viewers learn that BICEP2, an experiment co-led by Kuo, has detected a swirl pattern in the cosmic microwave background that would have been imprinted by ripples in space-time known as "primordial gravitational waves." And these could only have arisen during cosmic inflation, as corkscrew-like particles popped up in the gravitational field and then became stretched and permanently frozen into the shape of the universe. In the next scene, Linde sips champagne with his wife and their guest. In the early 1980s, Linde, Alexei Starobinsky, Alan Guth and other young cosmologists devised the theory of cosmic inflation as a patch for the broken 1930s-era Big Bang theory, which described the universe as expanding outward from a "singularity" - a nonsensical point of infinite density - and couldn't explain why the universe hadn't become mottled and contorted as it grew. Cosmic inflation provided a clever fix for these problems, and BICEP2's finding suggested that the theory was conclusively proved. "If this is true," Linde says to the camera, "this is a moment of understanding of nature of such a magnitude that it just overwhelms. Let's see. Let's just hope that this is not a trick." To many researchers, the most exciting thing about the alleged discovery was the strength of the swirl signal, measured as r = 0.2. The measurement indicated that inflation occurred at an extremely high energy scale and at the earliest moments in time, near the time-energy domain where gravity, as well as the effects of strings, branes or other exotica, would have been strong. The higher the energy scale of inflation, the more cross-wiring there would be between the inflaton and these other primordial ingredients. The result would be pronounced triangles and other non-Gaussianities in the sky. "After BICEP, we all stopped what we were doing and started thinking about inflation," Arkani-Hamed said. "Inflation is like having a gigantic particle accelerator at much higher energy scales than you can get to on Earth." "and if there really was exotic stuff up there [near the inflation scale], how you could go about looking for it." As these investigations took off, more details of BICEP2's analysis emerged. It became clear that the discovery was indeed a trick of nature: The team's telescope at the South Pole had picked up the swirly glow of galactic dust rather than the effect of primordial gravitational waves. A mix of anguish and anger swept through the field. Two years on, primordial gravitational waves still haven't been detected. In January, BICEP2's successor, the BICEP/Keck Array, reported that the value of r can be no more than 0.07, which lowers the ceiling on the energy scale of inflation and moves it further below the scale of strings or other exotic physics. pioneered the study of cosmological non-Gaussianities. Nonetheless, many researchers were now aware of the potential gold mine of information contained in triangles and other non-Gaussianities. It had become apparent that these fossils from inflation were worth digging for, even if they were buried deeper than BICEP2 had briefly promised. "Yeah, we went down a little bit," Maldacena said. But it's not so bad, in his opinion: A relatively high scale is still possible. 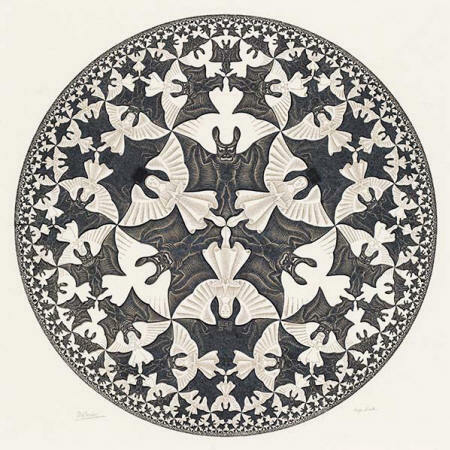 In a paper (Cosmological Collider Physics) last spring that drew on previous work by other researchers, Maldacena and Nima Arkani-Hamed used symmetry arguments to show that a key feature of string theory could manifest itself in triangles. String theory predicts an infinite tower of "higher-spin states" - essentially, strings vibrating at an infinitely rising sequence of pitches. 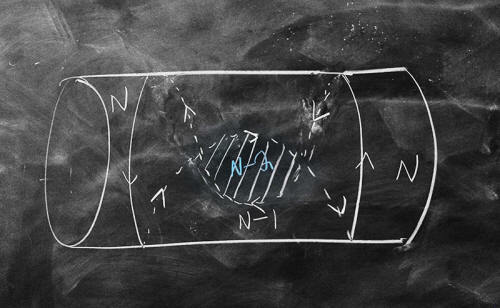 So far, no fundamental particles with a "spin" value greater than two have been discovered. Maldacena and Arkani-Hamed showed that the existence of such a higher-spin state would result in alternating peaks and troughs in the strength of the signal produced by triangles in the sky as they grow more elongated. For string theorists, this is exciting. "You can't build a consistent interacting theory of such a particle except if you have an infinite tower of them" like the tower in string theory, explained Daniel Baumann, a theoretical cosmologist at the University of Amsterdam. Finding the oscillatory pattern in the triangles in the sky would confirm that this tower exists. "Just seeing one particle of spin greater than two would be indicative of string theory being present." Other researchers are pursuing similarly general predictions. In February, Kamionkowski and collaborators reported detailed information about primordial particles that is encoded in the geometry of four-point correlations, which "get interesting," he said, because four points can lie flat or sweep into the third dimension. Observing the signals predicted by Arkani-Hamed, Maldacena and Kamionkowski would be like striking gold, but the gold is buried deep: Their strength is probably near the gravitational floor and will require at least 1,000 times the sensitivity of current equipment to detect. Other researchers prefer to tinker with bespoke string models that predict more pronounced triangles and other shapes. "So far we've explored only, I think, a very small fraction of the possibilities for non-Gaussianity," Kamionkowski said. Meanwhile, Linde and Kallosh are pushing in a totally different direction. Over the past three years, they've become enamored with a class of models called "cosmological alpha-attractors" that do not predict any non-Gaussianities above the gravitational floor at all. According to these models, cosmic inflation was completely pure, driven by a solitary inflaton field. The Escherian geometry provides a continuum of possible values for the energy scale of inflation, including values so low that the inflaton's cross-wiring to the gravitational field and other primordial fields would be extremely weak. If such a model does describe the universe, then swirls, triangles and other shapes might never be detected. Linde isn't bothered by this. In supporting the alpha-attractor models, he and Kallosh are staking a position in favor of simplicity and theoretical beauty, at the expense of ever knowing for sure whether their cosmological origin story is correct. 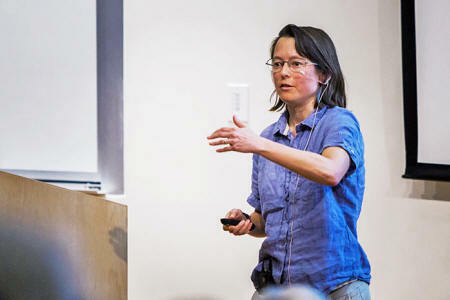 An alpha-attractor universe, Linde said, is like one of the happy families in the famous opening line of Anna Karenina. "Any happy family, well, they look in a sense alike. But all unhappy families - they're unhappy for different reasons." Will our universe turn out to be "happy" and completely free of distinguishing features? Baumann, who co-authored a book last year on string cosmology, argues that models like Linde's and Kallosh's are too simple to be plausible. "They are building these models from the bottom up," he said. "Introducing a single field, trying to be very minimal - it would have been a beautiful model of the world." But, he said, when you try to embed inflation into a fundamental theory of nature, it's very hard to engineer a single field acting by itself, immune to the effects of everything else. "String theory has many of these effects; you can't ignore them." And so the search for triangles and other non-Gaussianities is under way. Between 2009 and 2013, the Planck space telescope mapped the cosmic microwave background at the highest resolution yet, and scientists have since been scouring the map for statistical excesses of triangles and other shapes. As of their most recent analysis, they haven't found any; given the sensitivity of their instruments and their 2-D searching ground, they only ever had an outside chance of doing so. But the scientists are continuing to parse the data in new ways, with another non-Gaussianity analysis expected this year. Hiranya Peiris, an astrophysicist at University College London who searches for non-Gaussianities in the Planck data, said that she and her collaborators are taking cues from string cosmologists in determining which signals to look for. Peiris is keen to test a string-inflationary mechanism called axion monodromy, including variants recently developed by Silverstein and collaborators Raphael Flauger, Mehrdad Mirbabayi, and Leonardo Senatore that generate an oscillatory pattern in triangles as a function of their size that can be much more pronounced than the pattern studied by Arkani-Hamed and Maldacena. "in a very numerically intensive and demanding analysis," she said. "Then we have to do careful statistical tests to make sure we are not being fooled by random fluctuations in the data." Some string models have already been ruled out by this data analysis. "I find it surreal, because we are currently doing some traditional science with string theory." 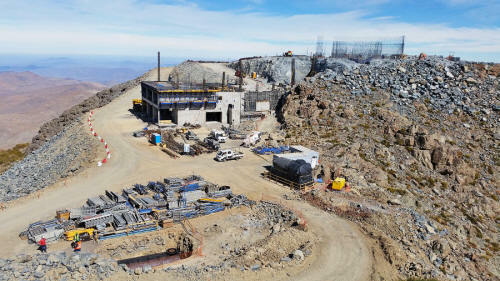 will be used to map 20 billion cosmological objects starting in 2023. 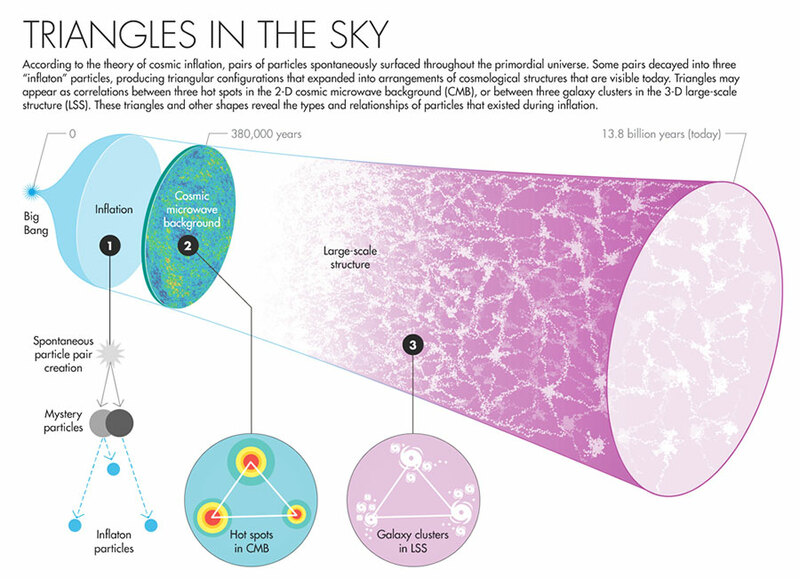 Moving forward, cosmologists plan to scour ever larger volumes of the universe's large-scale structure. Starting in 2020, the proposed SPHEREx mission could measure non-Gaussianity sensitively enough in the distribution of 300 million galaxies to determine whether inflation was driven by one clock or two cross-wired clocks (according to models of the theory known as single- and multi-field inflation, respectively). "Just to reach this level would dramatically reduce the number of possible inflation theories," said Doré, who is working on the SPHEREx project. A few years further out, the Large Synoptic Survey Telescope will map 20 billion cosmological structures. If the statistical presence of triangles is not detected in the universe's large-scale structure, there is yet another, perhaps final, approach. By mapping an ultra-faint radio signal called the 21-centimeter line, which is emitted by hydrogen atoms and traces back to the creation of the first stars, cosmologists would be able to measure even more "modes," or arrangements of structures. "It's going to have information about the whole volume of the universe," Maldacena said. If or when triangles show up, they will, one by one, reveal the nature of the inflaton clock and why it ticked. But will enough clues be gathered before we run out of sky in which to gather them? The promise of unitarity - that information can be scrambled but never lost - comes with a caveat. "If we assume we can make perfect measurements and we have an infinite sky and so on," Maldacena said, "then in principle all the interactions and information about particles during inflation is contained in these correlators" - that is, three-point correlations, four-point correlations and so on. But perfect measurements are impossible. And worse, the sky is finite. There is a cosmic horizon: the farthest distance from which light has had time to reach us, and thus, beyond which we cannot see. During inflation, and over the entire history of the accelerating expansion of the universe since then, swirls, triangles, quadrilaterals and other shapes have been flying past this horizon and out of sight. And with them, the subtlest of signals, associated with the rarest, highest-energy processes during inflation, are lost: Cosmologists will never be able to gather enough statistics in our finite patch of sky to tease them out, precluding a complete accounting of nature's fundamental constituents. In his paper with Maldacena, Arkani-Hamed initially included a discussion of this issue, but he removed most of it. He finds the possibility of a limit to knowledge "tremendously disturbing" and sees it as evidence that quantum mechanics must be extended. One possible way to do this is suggested by his work on the amplituhedron, which casts quantum mechanical probabilities (and with them, unitarity) as emergent consequences of an underlying geometry. He plans to discuss this possibility in a forthcoming paper that will relate an analogue of the amplituhedron to non-Gaussianities in the sky. People vary in the extent to which they are bothered by a limit to knowledge. "I'm more practical," Zaldarriaga said. "There are, like, tens or many tens or orders of magnitude more modes that in principle we could see, that we have not been able to measure just because of technological or theoretical inability. So, these ‘in principle' questions are interesting, but we are way before this point." "Yeah, it's a finite amount of information," he said. "But you could say the same thing about evolution, right? There's a limited number of fossils, and yet we have a pretty good idea of what happened, and it's getting better and better." If all goes well, enough fossils will turn up in the sky to tell a more complete story.